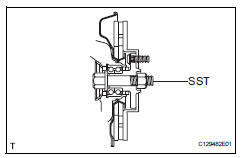 Drain the automatic transaxle fluid for u151f (see page ax-173). Squeeze the ends of the snap ring, and remove the snap ring from the bearing bracket. 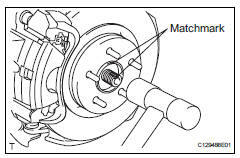 Remove the bearing bracket bolt and remove the front drive shaft from the bearing bracket. 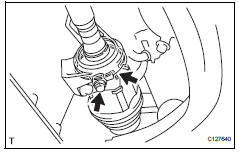 Do not damage the oil seal. 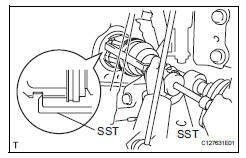 Do not allow the drive shaft to fall off. If the connection is stiff, use a brass bar and hammer to lightly tap the edge of the inboard joint rh and remove it.